Sharing some quilting progress I have made in the last few months. I will so the quilts one at a time so they each get their own post! 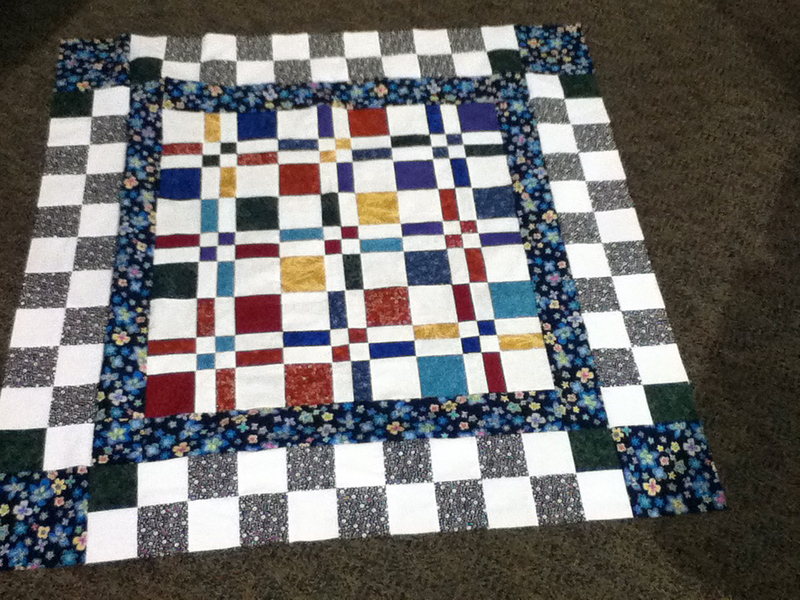 This quilt is essentially finished, minus the final hand-sewn step of the binding. I have sewn down the binding on the front and will work on the hand work Wednesday & Thursday of thanksgiving week – that’s next week! Or this week actually! I have had the top done for quite a while & finally decided a month ago to get on the ball with finishing this up. So the Tuesday before our holiday dinner with the guild, I quilted it on the long arm, using a pattern I had bought a year & a half ago – heart pantograph. 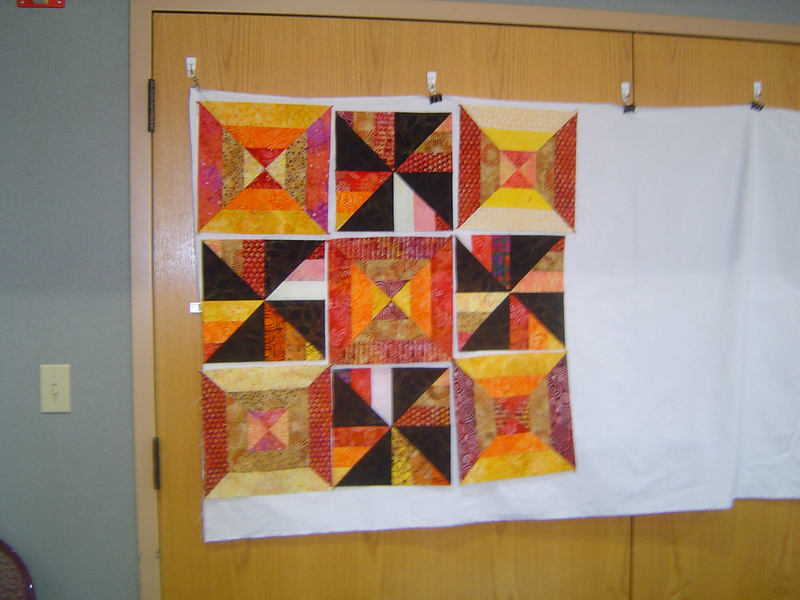 This was the follow up Tuesday after my quilting retreat, and it’s lovely to use all the “quilty momentum” – yes that’s a thing – to propel me in a quilting finish. 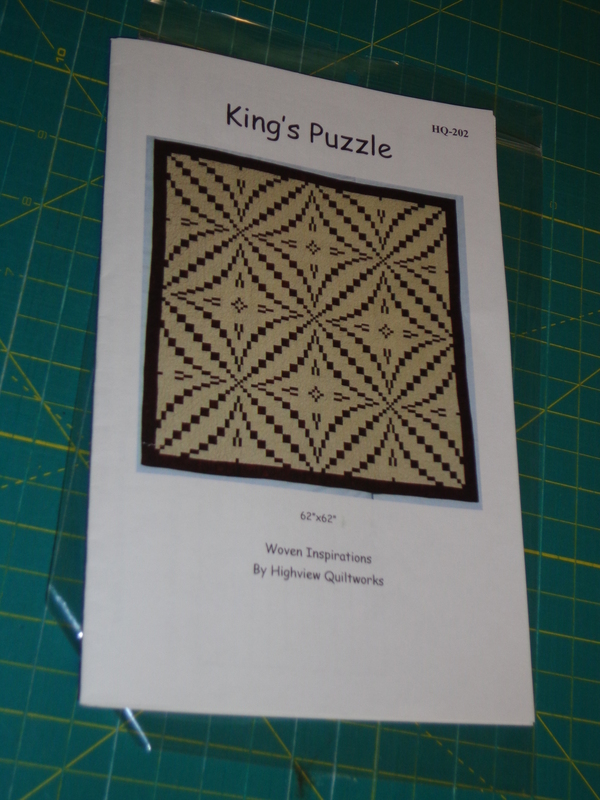 Unfortunately due to the ‘cathedralness’ of these windows, I should have glued them down prior to showing up to quilt it, it hit a few snags which I will also try to fix. It’s amazing to see the progress of such a quilt over time since it’s been so long ago that I’ve actively worked on the quilt. I’ll take you through a picture journey of this quilt throughout the process. Since I love process so much. First the fabric choices. This was due to a guild speaker or member who was doing a quick guild meeting on the 10 minute block. I picked these out early morning, anxious to see them all work together. Then doing the weird twist thing with the blocks. The red piece is folded over and sewn into groups of two other fabrics. Geesh it’s been a long time since I did this step! I remember needing lots of pins to get the middle to stay in there correctly. And then I was trying out some grey for the centers. To roll over some of the blocks. Then I had to make some visual decisions. And finding the right borders when putting these blocks together. I wasn’t even out looking for borders, they found me at Hancock fabrics when I went to get some interfacing for a completely unrelated project. And I remember finishing them up at retreat and then putting them all together there. Then five months later, I got the borders on. And after a year and a half at this state, I finally said – no more waiting. 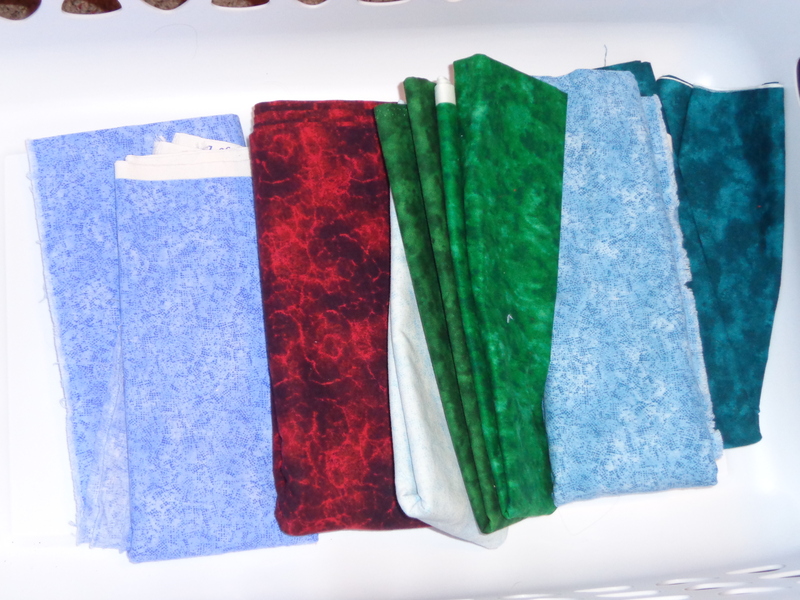 I have done some other quilty finishes and top finishes, but I am going to spread them out in several posts – maybe even set up to post this week! 28.3 Finishing it Up Just to Start Again! So I put one quilt on my “hit list” and that inspires me to get a “move on” for several others. I was writing up 5-6 different types of lists (by hand, not by spreadsheet) of different quilting projects at different stages, putting the quilt ideas into groups. Voila I still have many many that are ready to quilt for FMQ (which is mostly the stage I am at with my Exothermic Quilt anyway, but I’d like a tiny bit more practice. 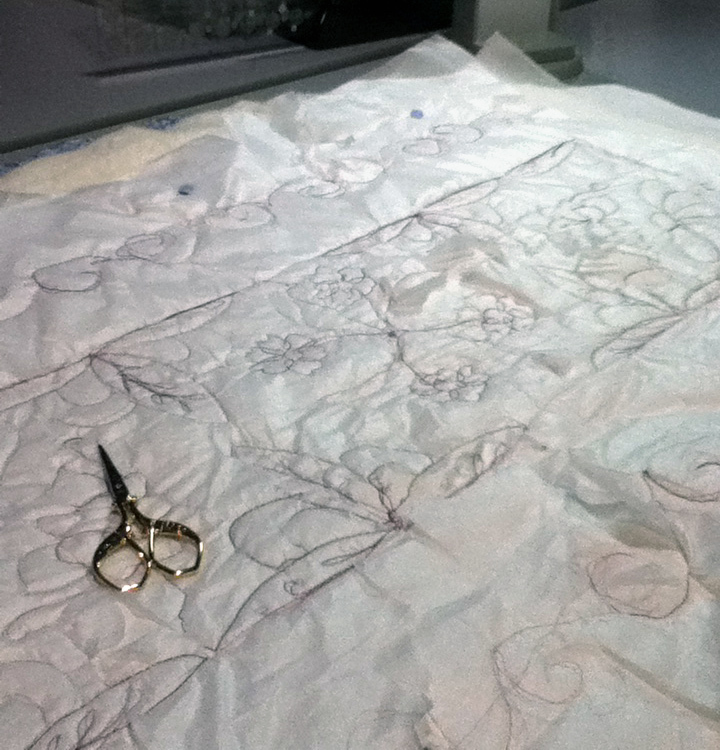 Yesterday, I got back out the FMQ foot and the arufil mono filament thread, and quilted down Dancing Ribbons. Only on the top of each ribbon, and only on the outline of the star. 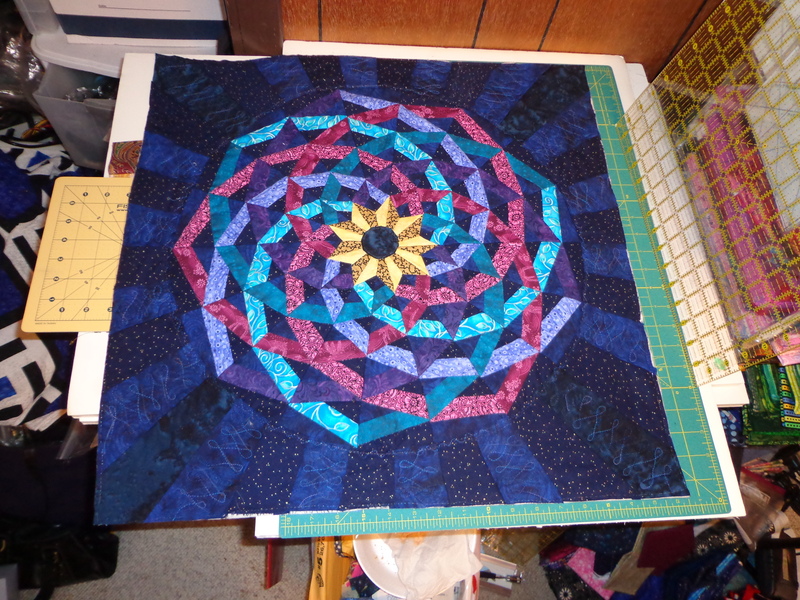 The first thing I did was to stabilize the outside circle with the monofilament thread but then I didn’t like I how I did that, and later went back and did another circle around the quilt with another pass of monofilament which was more stable. 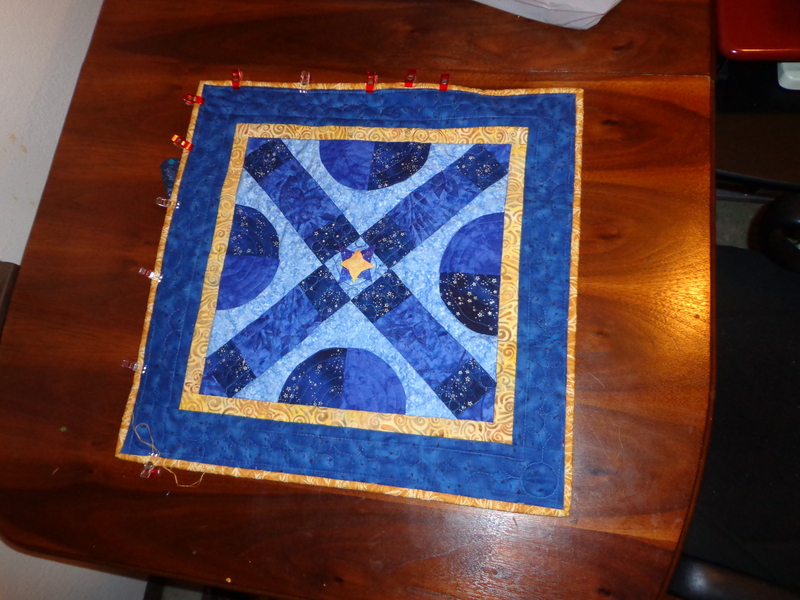 But then I quilted the outside with a colored thread. And then I got brave and decided to requilt the circle a third time with a ‘FMQ zig zag” which would eliminate my need to be good or perfect along the circle. So I quilted over my monofilament completely and as you can see I haven’t picked out the monofilament underneath yet. 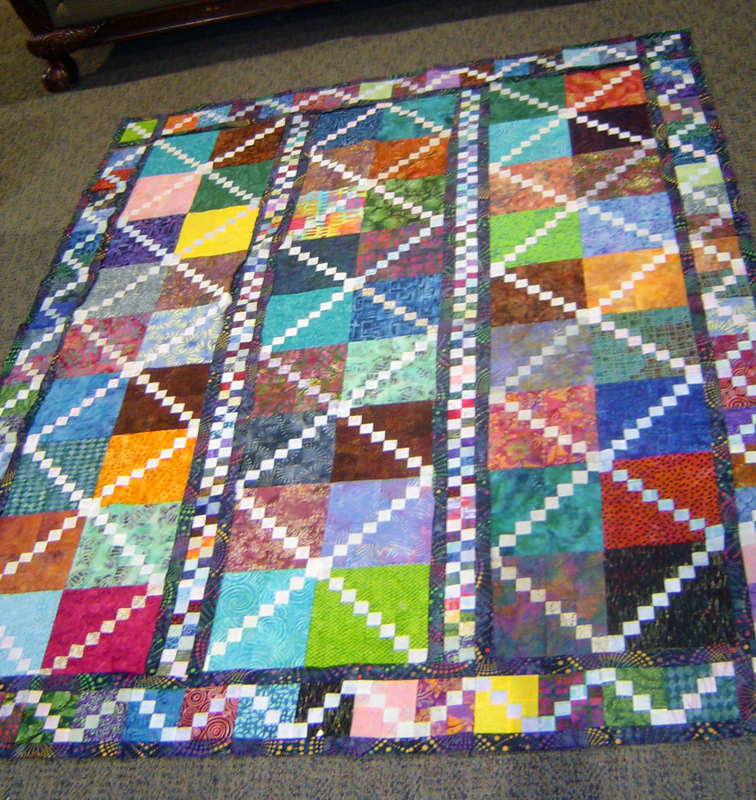 The quilt was originally sewn with white thread. All the wedges had white thread. When I basted this to a backing, the white thread kept showing through. Kept showing and I didn’t like it. I ripped off the quilt from the basting, and I took dark thread and sewed just a scant behind it. Never ripping out the white thread, but just by sewing 2 threads over inside the original seam every time the seam was stressed by pulling now what would be seen would be dark thread – which actually was a big improvement. And this helped tighten up the quilt that was sorta bulging in the center anyway. But it’s really hard to see the double seam and now the thing is quilted, and I forgot pictures. And here’s what I’m thinking for the binding (need to sew together & put on, but I think decided). Actually I may get a tiny bit of gold piping for the outside just a small amount of piping on this would be just the right touch. Will have access to piping foot and piping knowledge at a retreat starting wednesday. 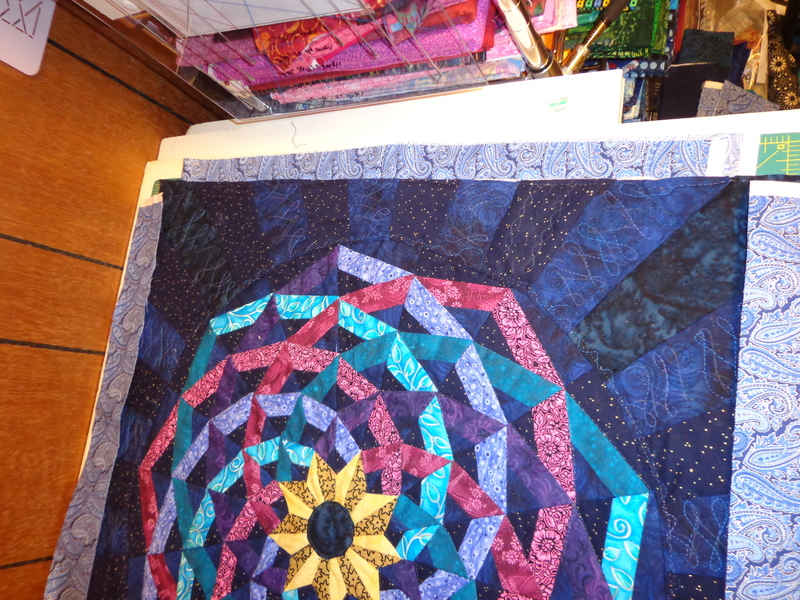 I am also finishing up some of the other mini quilts that I have quilted, by doing the finishing touches on – the binding of the minimalist fibonacci, the star on the space miniquilt & the binding on it. 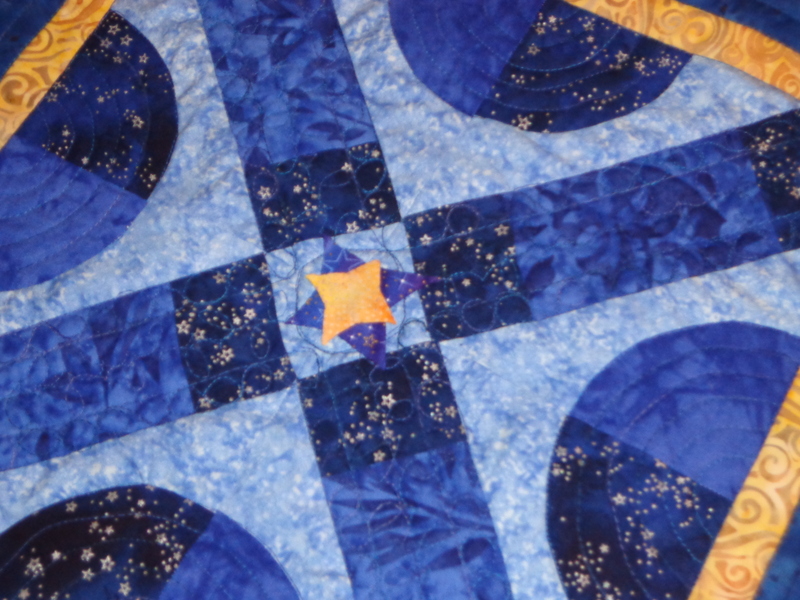 Here’s the appliqued stars in the center. As you can see there are now two stars and the circle is less noticeable in the center. Perhaps if I get crazy I could bead it up?? Perhaps. 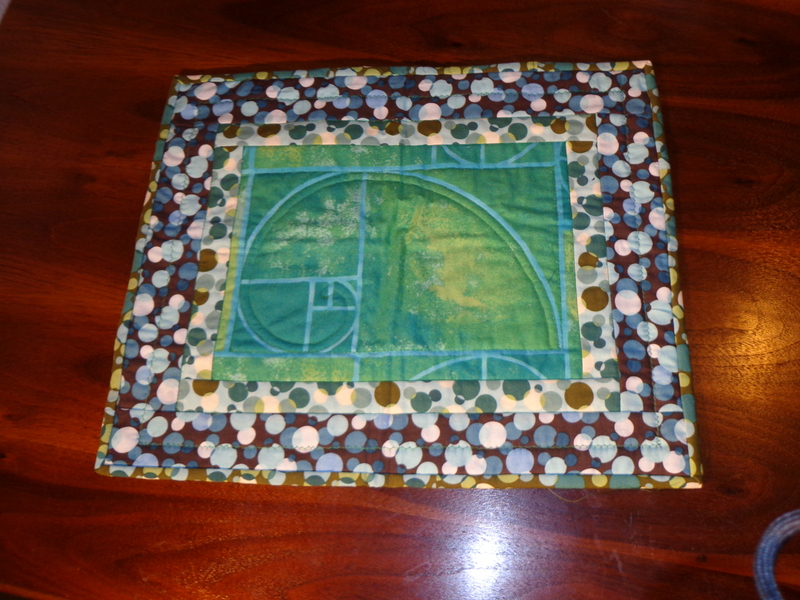 And the one fibonacci quilt? The other – the feather fibonacci, is probably getting ripped out this coming week. I keep looking and looking at the red back thread poking through – knowing I can do better with the tension. Or at least match the thread on the back with the front thread. And I was going to play up the red and go with a red piping, but unless the thread on top is quilted with red, I won’t use a red piping, but I do want to learn piping, so I’ll have a border piped around the edge of this border of some alternate color! And since I’m finishing, or near finishing – the darn LQS! 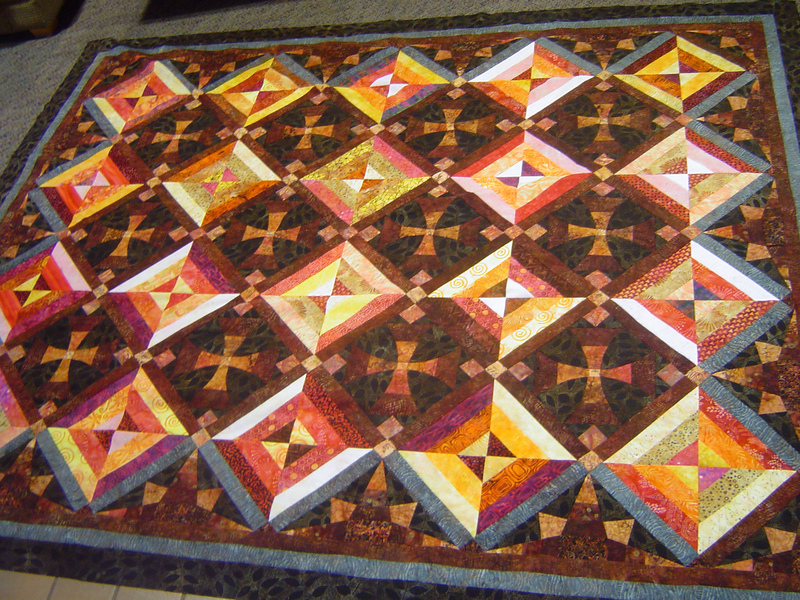 I had to go in there during a sale, and I HAD to see this quilt that was all quilted up with the sample quilt. And this quilt looks like it was just MADE FOR ME, so I had to purchase the pattern and decide to work on it this week at retreat! Take a look at the new shiny. VERY Darla-esque! 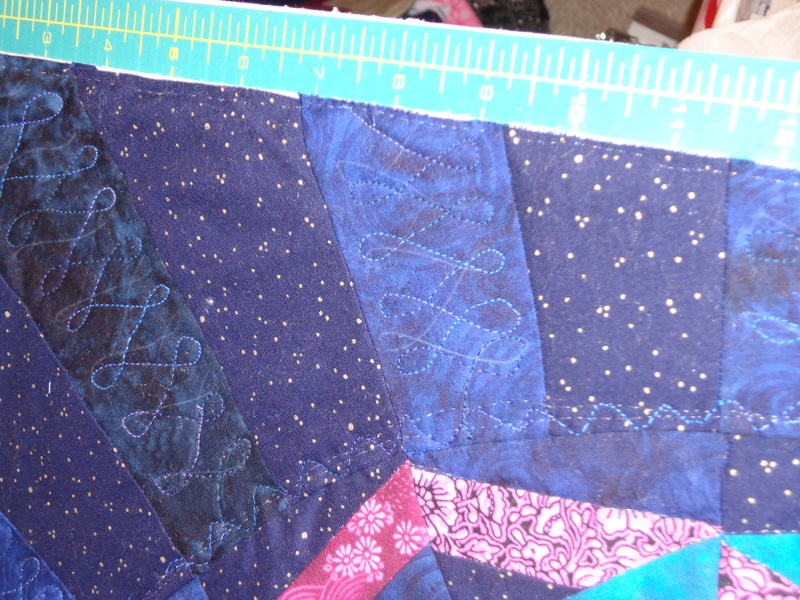 And since it calls for 4 yards of fabric for each color of the quilt, I will actually divide & conquer the sections with my neutrals (again – just like the gemini sky quilt) and possibly even my darks (I never have more than 2 yards of any kind of fabric). But on second & third thought what about red and black for this quilt? May have to also try that as well! Or black and hot pink? I may just switch up the fabrics or make several variations of this quilt, we’ll see how it goes with my original colors and fabrics. This week has been crazy fun and then back to normal. 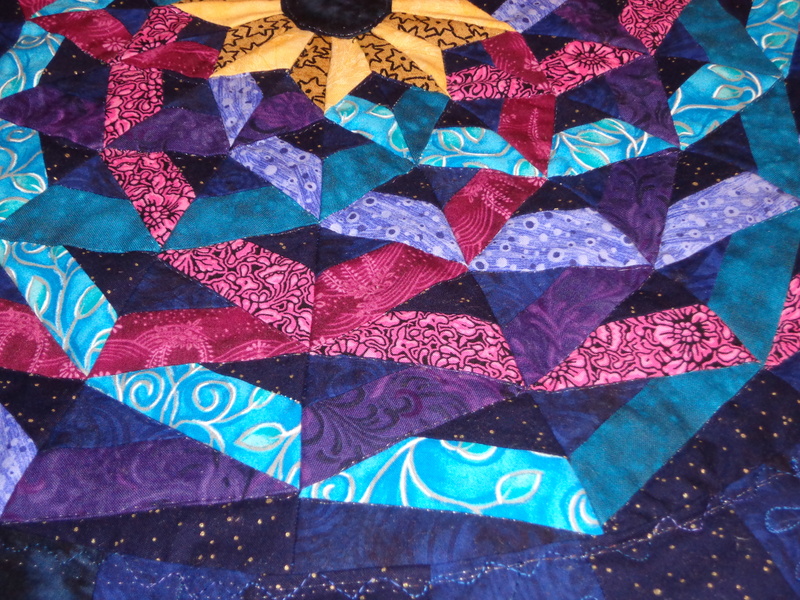 The thing I worked on first at retreat was my exothermic wonders quilt borders. This is as far away from the quilt top as I could get with it on the floor. So the borders are on the quilt, nice and simple. Like the drawing that I did in EQ a while ago. And I was attempting to piece the back the next day and instead I created a wallhanging with the leftover pieces from the defunct borders on this quilt. See my design wall, by the way, 3M strips and binder clips or office badge clips. Non permanent and useful. On the next day of retreat, I cut out, measured and sewed all the sashing strips to my DNA Steps quilt, and with double strips of sashing along the middle pieces and the border, this kept me pretty busy this day. The pieces are still in pieces, as I want to quilt this in pieces on my machine then sew it together. And finally, I was working on the borders of my disappearing four patch quilt, but for the life of me do not know why I only photographed it with my iPod camera rather than my real camera. So the colors seem more washed out in this last photograph than the first. I may donate this quilt once quilted to a local charity, I like it, but this one is probably meant for someone else. small lap quilt size. See the darker squares in the end, that’s green donated by my new quilting bud who is a math teacher at the local school system. She and I talked quite a bit because she was an early bird like me. (although way not as early as me). Silly me, I was going to put red in those squares instead of green. Good thing I had suggestions from others to help me think through that decision. I was incredibly glad I brought that quilt, because it was a place I was stuck and didn’t know what to do with it and how to measure it and fix it as I ran out of the black and white fabric on the borders. And when no one else was around to watch, I worked on this and promptly put it away before anyone got up. As you can see (or not well) I totally need practice. I don’t think I would recommend free motion quilting through tissue paper. One strike against me, I forgot my Machiniger’s quilting gloves – So I was gripping and pulling the thing under the machine, which completely ripped up the tissue paper on the sides. A good idea in theory, but the paper would rip way too easily and then occasionally would get caught under the presser foot. So now I have to move to pens and tracing quilt patterns rather than quilting over them because I think I may have exhausted my available options (no golden threads quilting paper around here that I know of). Anyway, it seems I got a lot done, but in truth, I had most of the centers and blocks done prior to going to the retreat.